It was time for my semi-annual weekday visit to North Vancouver for a dental appointment. 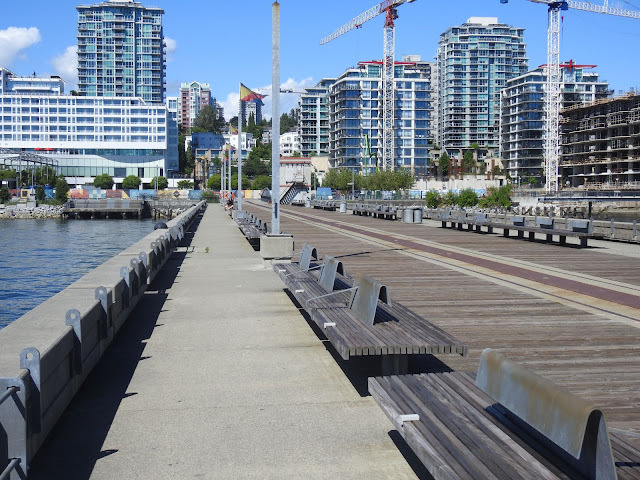 I always try to leave work early and make a stop at Lonsdale Quay before going up Lonsdale for my appointment. I made good time on this day and was able to park nearby and walk down to the quay. 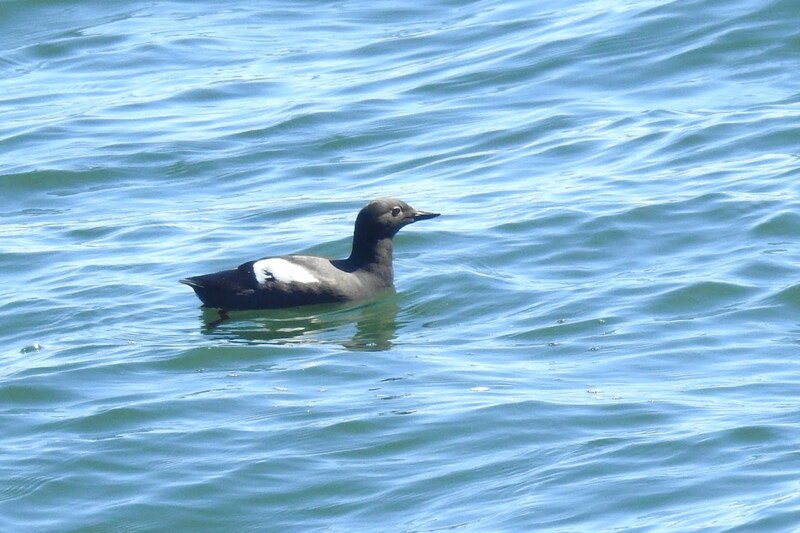 My first goal is to see one or more Pigeon Guillemots. 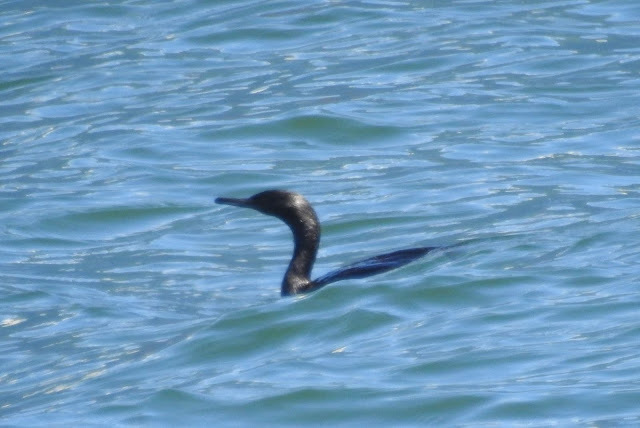 They nest under the Quay in early spring. This appointment was later in the year, but my luck held. Close to the pier was a pair of them. 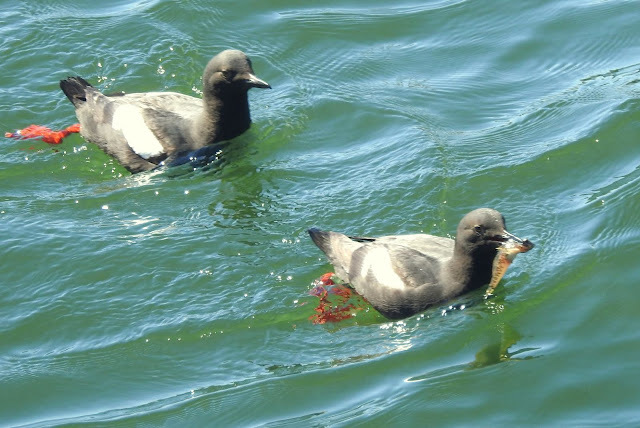 The lead bird had captured what may have been a shrimp. The second one wanted a share. Here's a close-up of the lead bird, I don't know if the trailer (possibly a mate or offspring) was rewarded on not. Another common bird in Burrard Inlet is the Pelagic Cormorant. 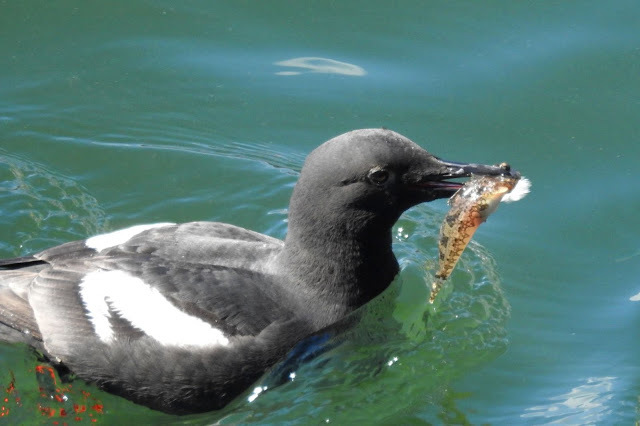 The best place to see them in numbers is Granville Island. Here's a solitary specimen. I got one more shot of a Guillemot further out on the Quay. 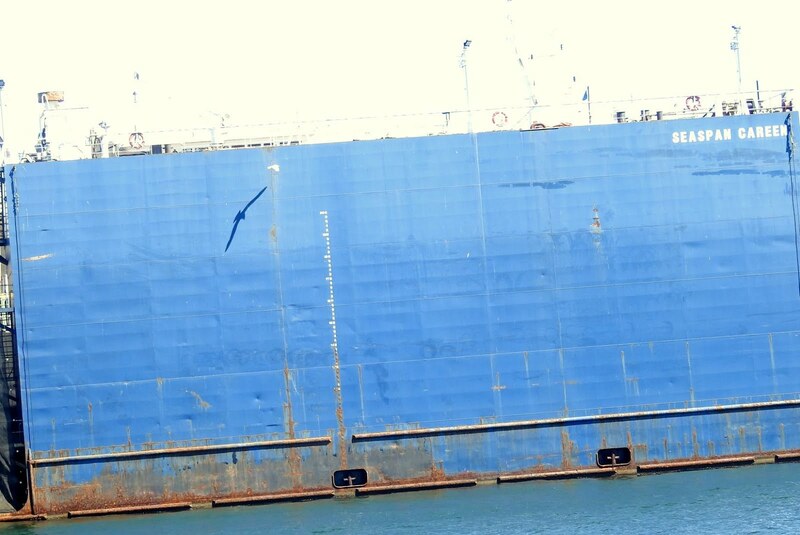 Across the bay from me was a large blue barge. I noticed Gulls flying near it, and then saw that they were casting shadows on the barge. It took me a while, but I eventually got a shot. I believe these were Glaucous-winged Gulls. 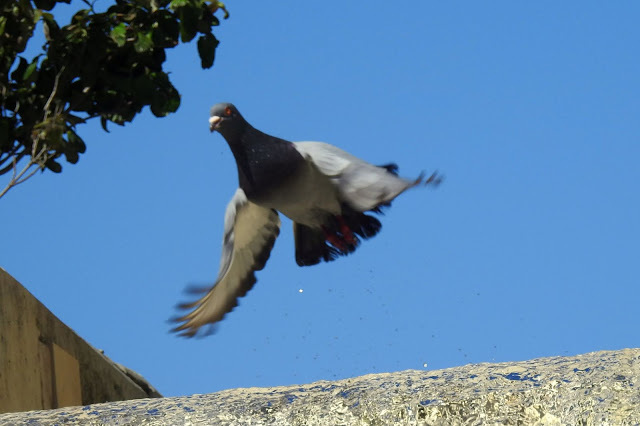 As I was returning to my car, I caught sight of a Rock Pigeon taking off from a ledge on an apartment building. My dental appointment went quite late and I was stuck in rush hour traffic. I needed some gas, so I decided to head towards Deep Cove, get gas and visit Maplewood Conservation Area until the traffic thinned. It was a hot afternoon and there was little bird activity. 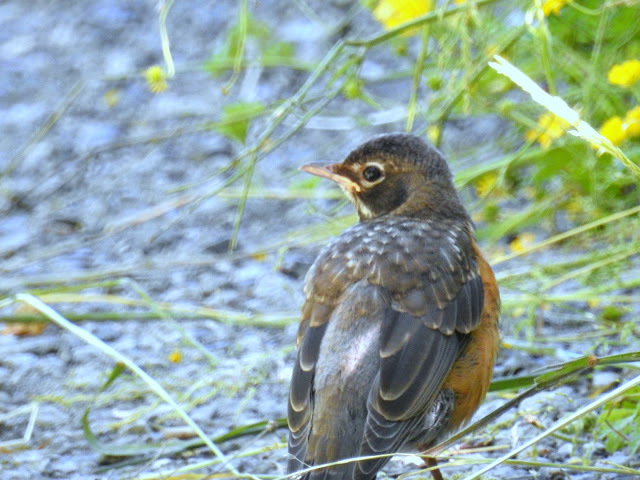 I did encounter this Robin on the trail. 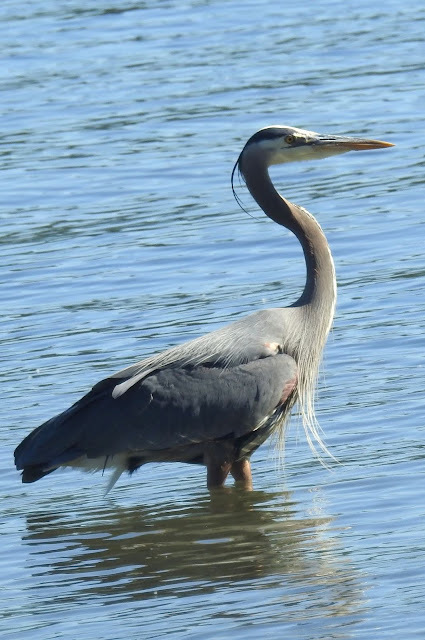 Another common bird seen was a Great Blue Heron on the shoreline of Burrard Inlet. 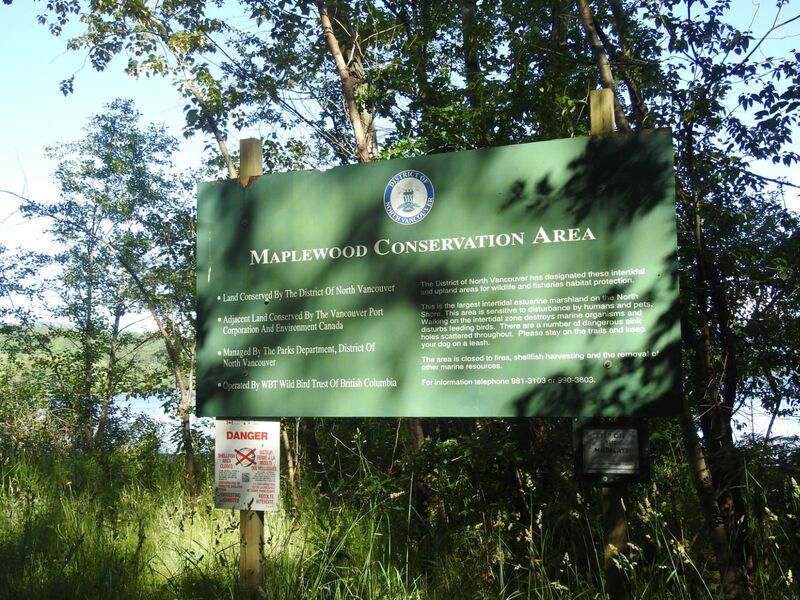 On my walk around the trails I did hear some Warbling Vireos, but could not locate them visually. I saw many Swallowtail Butterflies, but the Nikon is not too good at catching moving objects. I'd left my Canon SLR at home. I did get a photo of a Swallowtail in Alberta, stay tuned for a series of posts on that trip.